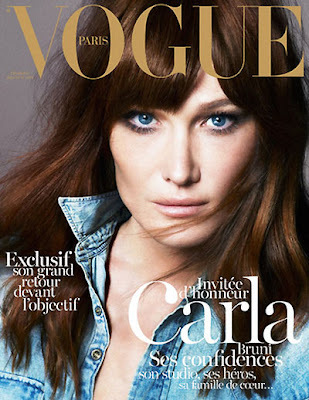 France's former first lady Carla Bruni Sarkozy returns to her modelling roots with Paris Vogue's December 2012 issue. Bruni takes on the role of guest editor and appears on the magazine's cover captured by the ubiquitous Mert Alas & Marcus Piggott. During her modelling heyday, Bruni formed part of that exclusive clique of women who reigned supreme over fashion's runways. While Bruni never quite reached the same lofty heights of success as some of her supermodel counterparts, she has achieved considerable recognition and acclaim beyond the realm of modelling as a singer, actress and activist. 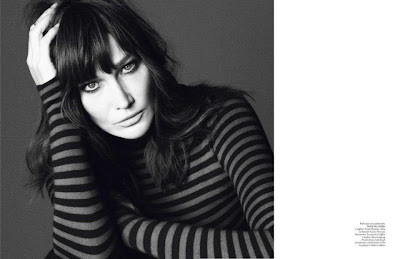 Bruni returns to modelling's fold, reuniting with her close friends and fellow compatriots Christy Turlington, Yasmin Le Bon and Helena Christensen. With the issue due for release December 3, model aficionados will be waiting with abated breath in anticipation of what the outspoken and opinionated Bruni has in store.